So you want gorgeous wedding invitations. Not, "Oh, that's pretty..." (then gets tossed in the trash once your wedding day is over). You want the jaw-dropping- "This invitation is STUNNING! ... so chic I feel guilty throwing it away (so I'll hold onto it for years)! "- kind of impact. And you want your invitations to be original. None of this fill-in-the-blank, cookie-cutter, "My cousin had that exact same invitation!" stuff. We're talking one-of-a-kind, knock-their-socks-off original. Believe it or not, this is possible! And it doesn't have to break the bank. Couldn't have said it better myself, Jack. That's why I'm so excited to bring you today's post: 3 Tips for Tackling Invitation Inspiration. Tip #1: Know what you want. When it comes to having a flawless invitation ensemble, indecision is not your friend. There are SO many options available to you. I know it can seem daunting at first, but colors, format, fonts, size, shape, texture, motif, folds (or no folds), enclosure cards, etc can all play a part in making your invitation extraordinary. 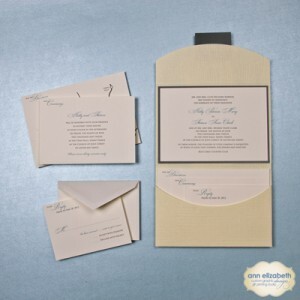 Get your hands on as many different kinds of invitations as possible, so you can see, touch, and interact with different styles of invitations. We love having brides come in and browse our showroom, especially for this purpose. Check out our studio hours here if you'd like to come see us! The other side of knowing what you want is knowing what you don't want. Make a written list! Sometimes your "Don't Want" list is easier to come up with, so it's a great place to start if you're at a loss for coming up with what you do want. Tip #2: Get out of your comfort zone. Many times, the best inspiration stems from something you never expected. Do you find yourself browsing invitations that all have the same kind of look? Delve into some that look completely different and see what you like. You may come up with a way to "marry" both looks and come up with something 100% original. Win, Win! What better way to both "wow" your guests and help them feel connected to your event than to have something meaningful in your life as a theme or decorative element? This could be anything from your love for the beach (using a nautical theme), to the title of your and your fiance's song, to the color of the sunset when he proposed. Don't be afraid to share these intimate (and sometimes vulnerable) moments with your guests. It will only make your invitations more cohesive and all that much more meaningful. For example, we recently had a bride incorporate into her invitations a watercolor painting she did herself. Not only was it absolutely stunning, it was absolutely personal. So lovely! 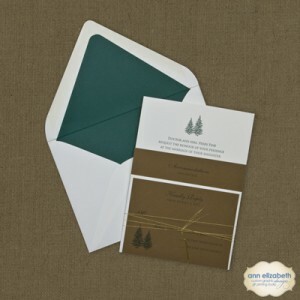 The bride behind the gorgeous letterpress invitations to the left chose an evergreen motif because of the location of her wedding. She felt like the colors, paper choices, and motif really set the tone for her event. We completely agree! The Ann Elizabeth team wishes you the best of luck in gathering your wedding invitation inspiration. Remember: Know what you want, Get out of your comfort zone, and Add your personal touch! You got this. Know someone struggling with finding invitation inspiration? Share this with them! Where have you found wedding invitation inspiration? We'd love to hear from you in the comments below! It is no secret that I am a huge believer in the impact color has on us. It's everywhere! But truly, color has a remarkable ability to transform the way you interpret things. I could talk for days about how our world of color impacts us, so for today I'll keep it to the color palette you choose for your wedding. Your color palette will set the tone for your event, so choose wisely. No pressure, right?? It will create the mood and set the tone for your event. When you think about it, you've got a lot of control over what your guests might feel at your event. It's cool to think that you have a say in the finest details of your event, right down to the mood and ambiance your guests interpret. Love it! I realize there's a chance you simply like a few colors and want those as your wedding colors. No problem! You can use this post to check the meanings of the colors you've chosen. Take a look at the following infographic, courtesy of yours truly, containing the ingenius content from mywedding.com. Not every color in the book is listed here, but you'll get a good idea for the symbolism color has, and the affect it'll have on your event.